This is another little introduction into the difficulty of developing GUI applications for Perl, and Perl's power to make difficult things easy. 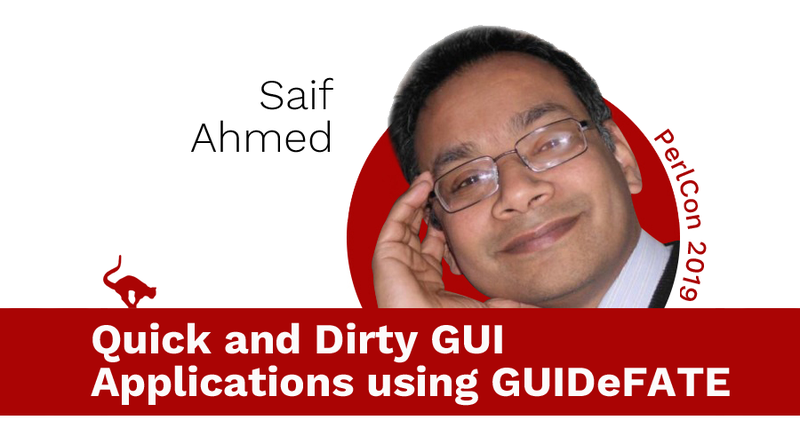 GUIDeFATE (GUI Design From A Text Editor) was introduced at The London Perl Workshop (LPW) last year. This time a more in-depth exploration is done. The talk is in three parts. 1) The core features are described; GUIDeFATE takes a textual representation of a GUI, detects widgets in that representation, and then transforms the widgets identified to back-end specific code to generate the actual interface. 2) Then two (or three, depending on time) scenarios are described and code walk-through to create these applications quickly; these applications are a simple text-editor, a GUI front-end to a command-line application, and possibly a desktop network monitoring tool. 3) The last 15 minutes of the talk will be an interactive attempt to create an interface with the audience along with the code to control a networked robotic device running on a Raspberry Pi over ssh -X (hopefully, fingers crossed, this will not be a disaster).